Junior Mints Eggs are the perfect Easter Candy. They have the same cool mint centers, however the candy coating on these are pastel colors rather then dark chocolate and are shaped like eggs. Each box has a variety of yellow and blue junior mints eggs. 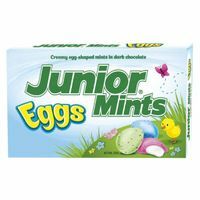 These are the perfect Easter treat for those you like the classic old time junior mints, same great flavor just in in the shape of eggs for Easter. These are a limited edition and sell out very quickly, so order yours today. Each box is 3.5 oz and has approx. 40 mint eggs.